ZOETERMEER, the Netherlands — The red-haired boy was riding his black bicycle home from school on the afternoon of Jan. 20, 2009. He was pedaling along the bike lane of First Station Street, when a truck made a right turn, into the bicycle’s path. The boy was snagged by the truck’s rear axle and dragged for a few feet before the driver noticed the mangled bicycle in his sideview mirror. Twelve-year-old Hananja Konijn was pronounced dead the next morning. Five days later, investigators closed the intersection. Along with clipboards and cameras and measuring tape, they brought with them an 18-wheeler and a child-sized bicycle. Over and over, they maneuvered the two around the corner, recreating the all-too-common “right hook” accident in slow motion, each time adjusting the truck’s mirrors or the angle at which it struck the bike. In the Netherlands, accidents like these are followed by intense investigations, street redesign, and criminal prosecution on a level wholly different from Boston, where a slew of bike fatalities in recent years have prompted modest on-street changes and police crackdowns on bicyclists running red lights. But there have been few street design overhauls and no criminal convictions of motorists in those fatal accidents. 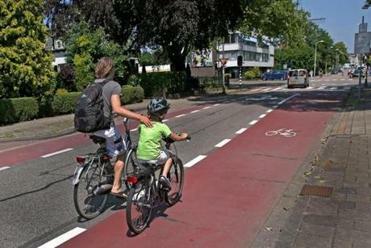 Officials in Zoetermeer, the Netherlands, painted larger bicycle lanes and made other improvements to increase safety at one intersection where a fatal accident occurred. The immense dedication of resources reflects a wider attitude in the Netherlands, experts say, that bike accidents are a preventable public danger. Such a response to each of the country’s approximately 200 annual bike deaths is part of the reason why the Netherlands is among the safest countries on Earth for cyclists. Marco Gehlen, a Hague police traffic investigator, said real-life accident reenactments are required for every bike fatality or serious injury. In the case of high-speed crashes, the effort is outsourced to a company in Germany, which videotapes the test crashes with slow-motion cameras. The service costs the Hague police more than $13,000 for each case. Rigorous accident investigations in the Netherlands are also used to quickly redesign streets in the aftermath of a fatal crash. In Zoetermeer, a complete intersection overhaul occurred in less than a month. Engineers installed a mirror beneath the traffic light, for drivers to better spot approaching bicycles. A bicycle waiting area was added, ensuring that bicycles cross the intersection before cars can make a right turn into their path. A lane of vehicular traffic was eliminated and the width of the bike lane doubled. The bike lane was painted bright red. The criminal prosecution in the case also came quickly, and under rules of evidence very different from those common to American courts. The truck driver was charged within days and a year later received the maximum sentence of 240 hours of community service and a provisional sentence of two months in prison. His driver’s license was revoked for 18 months. It wasn’t a particularly harsh sentence, and community members said it didn’t need to be. But, they say, it was important for a person to be held responsible under the law. And under Dutch law there was no doubt who that person would be. The legal system automatically places all of the responsibility for crashes on the motorist, not the cyclist. Even if a driver proves the crash occurred because of a bicyclists’ wrongdoing, the motorists’ insurance company is still responsible for at least 50 percent of the damage to the bike and its rider — and it’s automatically 100 percent if the cyclist is a child. “The car is always wrong, by law,” said Amsterdam urban planner Rob van der Bijl. But Van der Bijl said the laws reflect the physical realities of interactions between cars and bicycles — the fact that people inside cars are virtually never harmed in an accident with a bicycle. By deciding to get behind the wheel of a car, drivers are inherently taking responsibility. “It’s a deadly weapon, the car. So it’s good to protect those who are most vulnerable,” he said. It’s an attitude reflected by police officers like Constable Tommy Hamelink, head of the Hague police bicycle unit, who admitted he is half-hearted about ticketing bike riders for gliding through red lights or drunk cycling. Instead, he said, police focus on the issues they believe most help people avoid accidents: Putting lights on bicycles and encouraging cyclists not to ride in the blind spot of large trucks or buses. About a decade ago, Gehlen said, truck-on-bike right-hook collisions like the one in Zoetermeer resulted in dozens of deaths per year, most of them among children. But the hazards of riding alongside trucks began to be taught to children in their school bike-education programs. Ten years later, he says, that number is down to 10 to 15 deaths per year from right-hook collisions, mostly among middle-aged cyclists.